AB MAURI is a global family of yeast and bakery ingredient companies and one of the largest producers and distributors in the world, striving to be the leaders of innovation within the industry. With over 7,000 employees working across 52 plants, operations in 32 countries and sales in over 100 countries, AB MAURI is Associated British Food's (ABF) most globally represented business. Our businesses offer a heritage of 150 years in the bakery industry and our mission is to continue to deliver unique combination capabilities throughout the value chain. Are you driven to make a difference, think creatively and deliver successful results? If your answer is yes than AB MAURI is the place for you! Our work is inspiring, fast-paced and focused on continuous improvement to ensure we are driving the business forward in a sustainable and ethical way. In order to be technology leaders we need people with curious minds, the courage to experiment and driven to prove their potential. There is no single way to develop your career with AB MAURI – the decision is yours as to how you develop your skills and knowledge within the diverse nature of our business. With our focus on innovation, we want our employees to think differently about how we do things to continue to stretch, challenge and improve our business. With over 80 offices and sites across the globe, as well as supporting career moves within ABF, there are many opportunities to develop your professional career with us. We offer exciting opportunities across a wide range of functions including Applications Technology, Research, Manufacturing & Supply Chain, Marketing, Sales, Business Development, Procurement, Finance and HR. 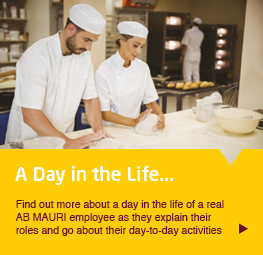 To find out more about the types of roles we have within AB MAURI, check out the "A day in the life" section. We actively work together across global boundaries, with our country General Managers at the heart of what we do. Culture and collaboration are key! This is an exciting time to join our business as we focus on creating a competitive and sustainable organisation which balances local need with global direction to achieve great results. If you think you have the skills, drive and innovative spirit to join our teams around the globe and can contribute to our business then get in touch with the HR team in your region using the regional map or email careers@abmauri.com.